FOR SALE AS OF 31 MARCH 2019. Please see www.dizzy-heights.com. Perfect for adults with discerning tastes looking for a classy & serene home-from-home retreat, with a very large terrace bathed by the sun from sunrise to sunset with a beautiful 180 deg vista of the Mediterranean, mountains & surrounding area from the lounge, bedroom, & fully furnished & secluded terrace, located on a small private residential complex away from the hustle & bustle of the tourist areas. The apartment is fully air-conditioned & also has ceiling fans. Winter heating is catered for by wall mounted thermostatically controlled convection heaters. Winter Guests are provided with complementary slippers & the use of warm velour dressing gowns. An electric blanket, thermal duvet, & a 5 kilo Dream Blanket are also in the apartment - just in case. Complementary WiFi & British SAT TV provided for our Guests - no extra costs. Double patio doors from the lounge & bedroom lead directly onto the beautiful fully-furnished & half grassed (artificial) terrace complete with gas BBQ. Gas is provided complementary for Guests. The apartment is large, elegant, tastefully furnished, homely & fully equipped & has a very pretty, private & serene complex pool with bathrooms & showers, surrounded by flora & fauna. As the apartment is on a private, residential complex, there is no influx of children, so peace & quiet is the norm. Prices quoted are fully-inclusive & there are no hidden or extra costs. Alternative payment methods are available upon request. A small but well stocked supermarket, English Deli, chemist, hairdressers, beautician, bank & several other outlets are a few mins walk from the apartment. The quaint Tala Village Square is a 3 min drive or 20 mins walk with shops, restaurants, tavernas & bistros; all loved by visitors as well as the Cypriot & British residents for its charm. A great Cypriot restaurant is a 2 min walk, & serves a superb British Sunday lunch commencing at 01.00 pm (closed on Sunday evening). Almost opposite is an excellent Italian restaurant. Pre-booking for both is advised. A 15 min drive takes you to Paphos with its beautiful promenade, Fort, popular tourist areas, & a night life to suit all tastes. Tala is perfectly located nestled in the hills in the Paphos district of Cyprus because it is central to everywhere. The owner lives close by & is on hand to provide assistance & advice. Incredible 5 Star Guest Reviews & many repeat bookings. If Guests are planning on meeting up with family or friends, we ask our Guests to ask permission for said family/friends to enter the apartment. Failure to do so will result in the loss of the Security Deposit. After several disappointing self-catering holidays, I challenged myself to create the perfect holiday home; one I would love to revisit. I had experience as a Guest, & knew exactly what I wanted to find on my self-catering holidays. "Dizzy Heights" is even more, as I have taken it into the luxury bracket, whilst still keeping costs in perspective, & the wonderful comments in the Visitors Books & the 5 Star Reviews speak volumes. I like to get to know my Guests & we exchange several e-mails prior to arrival. I live close by & I am available always. Many of my Clients have said "we contacted a stranger but met as friends." Perhaps I shall have the pleasure of welcoming you to my beautiful "Dizzy Heights" on the magical island of Cyprus, where the hospitality & warmth of its people is truly in abundance. We chose Tala because it is perfectly located on a beautiful private & serene complex with incredible views of the Mediterranean sea & the mountains, & a wonderful Cypriot & British community. A 2 min walk to a; small supermarket catering for practically everything, a British Deli, a chemist, restaurants, bank, hairdresser/beauty parlour & several other outlets. The bubbly & beautiful Tala Square has a great choice of dining venues & is loved by residents & visitors alike for its special charm & hospitality. Everything & everywhere else is but a short drive away; as Tala is perfectly central to explore the whole of Cyprus. "Dizzy Heights" is a delightful light & airy luxury home-from-home with a large fully furnished terrace bathed by the sun from sunrise to sunset, in the most exquisite location with gorgeous unobstructed views of the Med & local area. Guests have returned to enjoy - & I quote "a little piece of heaven". You will be staying in our elite Tala Village in a luxury home-from-home, perfectly situated for stunning views of the Med from all rooms & the terrace, bathed by the sun from sunrise to sunset. You will be a 15 min drive from Paphos' sea front, harbour & tourist areas. You will adore lazy, peaceful days on the terrace or by the private & secluded complex pool; surrounded by flora & fauna, perhaps reading a book from the library. You will have the choice of home dining inside or on the terrace under the gazebo with its twinkling lights & perfect vista, or enjoy the selection of Tala restaurants, with menus to suit all tastes. Tala has everything for a perfect switch off without leaving our unique village, & there is our private Kamares Club Restaurant & facilities also - & you are only 15 mins from so many wonderful sights - perfectly perfect. Fully tiled with bath/shower over, 2 shower curtains, wc, sink with under unit, mirror, shaver socket, shelving, non slip bath mat, floor rug, extractor fan, ample high quality towels & beach towels, laundry basket, hot water (solar panels & immersion heater), First Aid Kit & many bathroom basics provided complementary. Additional towels are provided for stays in excess of 7 nights. Air-conditioning & ceiling fans throughout the apartment. No additional charges for air-conditioning - fully-inclusive really means fully-inclusive. Winter heating by way of thermostatically controlled digital wall mounted electric heaters. No additional charge for heating - fully-inclusive really means fully-inclusive. Beautiful top quality cotton bedding all provided. For Winter Guests there is a duvet, 5 kilo dream blanket, electric blanket, complementary slippers & the use of warm velour dressing gowns. Front loading washing machine with instructions, washing liquid & clothes softener provided. A drying maid, ample pegs & a clothes basket also provided to enable washing to be carried outside. Fold up clothes drier, washing basket & pegs all provided. Ample space on the terrace to dry washing. Parking is always available on the complex. From the parking area to the apartment is a 3 min walk. Internet provided free of charge for our Guests, together with English TV including BBC News, BBC 1, 2 & 4, ITV 1,2, 3 & 4, as well as many other popular channels. Ample top quality bath, hand, beach & tea towels all provided. Note: bed linen & towels - additional is provided if your stay exceeds 7 nights. MED facing; patio doors to large terrace, English SAT TV, DVD/CD, WiFi, radio, media library, leather 3 piece, coffee tables, dining table/chairs, cocktail cabinet, lamps, Persian rug, pictures, cushions, A/C, ceiling fan & so many more homely touches. A large fridge freezer in the kitchen, which is more than ample for all your refrigerated shopping. Electric 4 ringed hob with a lift up lid. Electric oven, which will take a large Christmas turkey. Microwave & suitable dishes provided, & there is also a toasted sandwich maker for that "must have" snack. A coffee peculator & a Cyprus coffee maker are in the apartment. There is also a cafetiere, so you have a choice of how you want to make your coffee. A 2 slice toaster & a toasted sandwich maker are provided. We provide our Guests with complementary milk, tea, coffee, sugar, bread, butter, jam/marmalade, eggs, bacon, cereal, 2 bottles of wine & 6 Keo beers - Guests preferences are purchased as requested. More than ample matching crockery, cutlery, utensils, pots & pans of all types including frying pans, a wok, splatter guards, cutting boards, cool box - everything & more than you will require. Electric hob/oven, washing machine, fridge/freezer, microwave, toaster, sandwich maker, kettle, ample crockery, microwave dishes, cutlery, kitchen utensils, pots, pans, wok & day out self-catering items. Many kitchen essentials provided complementary. Oval tempered glass dining table & 4 chairs. Beautiful crockery, cutlery, glasses, place mats, coasters, wine cooler, napkins, table lights, music, & everything you will need for romantic home dining. 32 inch flat screen TV in the lounge area with popular English television channels. UK TV provides English channels - including BBC 1 to 4, ITV 1 to 4, & a large selection of channels including 5USA, Yesterday, Channel 5, CBS Drama & Reality, & many more too numerous to mention. The radio is tuned to the English radio station "Sunshine Radio", which plays beautiful easy listening music, with world-wide & local news, & updates of events in the Paphos area. The apartment has a DVD player & a large selection of DVD's to suit all tastes. Large library in the bedroom & you are guaranteed to find that perfect holiday read. Guests may leave a book in exchange for one they have not completed & wish to take home. A selection of games including playing cards are in the apartment. There is a large selection of CD's to suit all tastes including Christmas CD's for our Festive Guests. Beautiful L shaped terrace has specific seating, sunning & dining areas, each elegantly furnished to enable you to really enjoy being outside in perfect privacy & serenity & with stunning views. The impressive Troodos mountain range stretches across most of the western side of Cyprus, offering cool sanctuary & idyllic hours spent in long walks in its scented pine forests in summer. Between January & March it snows on the top peaks enabling skiing in winter. There are ten ski runs & several cross-county trails, which are suitable for beginners, intermediates & advanced skiers. There are also cafes & restaurants, equipment hire shops & a ski school. The ski centre is a 90 minute drive from Paphos & during March you can ski in the Troodos Mountains in the morning & relax on the beach in the afternoon. Our beautiful Kamaras Club is available to Guests to enjoy a game or two of tennis, the Club pool & restaurant. Aphrodite Hills Golf Course - an 18 hole course with challenging fairways cutting through lakes, olive & carob trees as they follow the scenic contours of the two plateau. Secret Valley Golf Course - an 18 hole course, set in a scenic valley surrounded by mature trees & natural rock formations. The first 9 holes contain 2 birdie opportunities & an easy dog-leg giving you a gentle warm-up before the more challenging back 9. Minthis Hills Golf Course - an 18 hole course set in the grounds of a 12th century monastery, lying in a picturesque valley 550 metres above sea level. The fairways are lined with thousands of trees, & the undulating greens are a challenge yet provide a perfect putting surface. Elea Golf Club - a challenging 71 par 18 hole course designed by the legendary Sir Nick Faldo, situated in the Elea Estate in Paphos & incorporates numerous natural features & boasts stunning views of the Mediterranean. All the above golf courses are within easy reach of Tala. There are 34 steps to the front door of "Dizzy Heights" & is unfortunately not suitable for confined wheelchair users. Our residential complex has a lovely 12.5 m x 6.0 m (38 ft x 18 ft) kidney shaped pool for the use of owners & Guests. Most of the owners come out twice a year so it is serene & no influx of children. Mr & Mrs Maureen Folan F.
Thank you so much for your fabulous review, which is very much appreciated. We are delighted you found everything to your liking. It is such a lovely feeling when after putting in lots of effort for each and every guest, our efforts are rewarded with perfectly happy Guests. It was such a pleasure to make your acquaintance, and we wish you many more happy holidays here on our beautiful island of Cyprus. Sincerely Dizzy. Dizy Heights left me in a spin! We had a fab week at the Apartment, all our needs were catered for and the peace and tranquility was just what the doctor ordered. Janis is very thorough on the details provided and the welcome pack was fantastic and got us started. The terrace has wonderful views of Paphos and whilst we were there gave us a great view of a storm, perfect. If I were to be ultra critical I would say the beds were a little uncomfortable and the shower not powerful enough for my needs but this did not take away from the fantastic time we had and the wonderful host Janis is. Hi Samantha. Thank you for your mostly positive review, which is very much appreciated. I am a little mystified at your comment re "the beds were a little uncomfortable" because there is only the king size bed in the one bedroom apartment, and all my previous guests have told me how comfortable the mattress is. It is a firm mattress so perhaps you prefer something a little softer? Unfortunately the shower is not the power blaster you are obviously used to back home! It was such a pleasure to meet you, and I am pleased to note that on the whole you had a positive experience at "Dizzy Heights, and that I passed muster as a hostess! Sincerely. This was our second stay in this absolutely stunning apartment which is in a truly wonderful location. I just do not know what to add to all the previous reviews but I shall try. From start to finish it is just chill, relax, chill, relax. Dizzy does not go the extra mile, she does a marathon ! The welcome pack is superb, Dizzy gives you choices before you arrive on lots of useful food and drink items you may need to help see you through your first few days. Then there are also all the toiletries as noted in previous reviews. The apartment is cleaned to 5* standard both inside and outside. 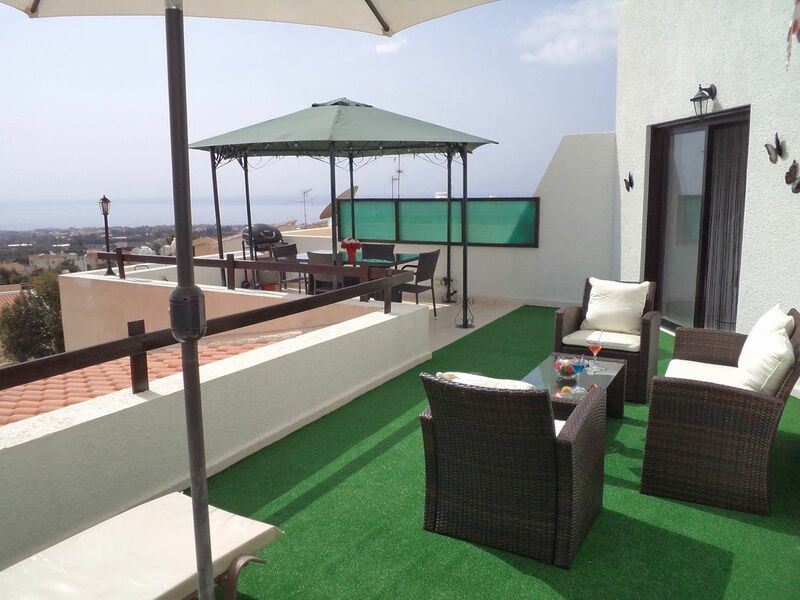 The terrace is fantastic, extremely spacious, and a real sun trap with sunbeds, sofa, lounge chairs, and a large dining table which looks magical at night with the little lights. There is also a useful electric sun canopy for when it gets too hot as well as other parasols for use with the sun loungers. Dizzy really has thought of everything. There are just stunning panoramic views down to the coast, I could just stand and stare at them all day. Dizzy and her husband just could not do enough to ensure that you have everything you need to make the most of your stay but they are totally unobtrusive. However, it was good to know that if you needed any advice or help they were so easy to contact. The pool looked lovely and clean and appeared to be used by very few people whilst we were there. There is a small shop close by that sells most items you could need and there are several large supermarkets only a few minutes drive away. In Tala there are several excellent restaurants, my favourite was Casa Luna, excellent quality and choice but the portions were far too huge! They also offer a takeaway service if you do not feel like venturing out, but you really should. If you are looking for somewhere to totally relax and unwind in a beautiful location then look no further you have already found it. The fantastic terrace caught my eye and certainly lived up to expectation. Apartment is very well equipped and all the extras Dizzy provides from beach towels to toothpaste makes it easy to travel light. A first rate welcome pack, more like a luxury Christmas hamper! Ideal for the lazy relaxed break we wanted. Thank you for your lovely positive review, which is very much appreciated. Holidays are special and should be stress free, so I am delighted "Dizzy Heights" lived up to your expectations. It would be a pleasure to welcome you both again sometime in the future. Sincere Regards, Dizzy. We spent three weeks at Dizzy Heights.It is a beautiful apartment in a lovely quiet location with a breathtaking seaview from the huge balcony which is fully furnished with luxury outdoor furniture and a bbq.The apartment is spotlessly clean and everything you can think of is provided.Examples: shampoo,shower gel,selection of sun lotion,selection of general toiletries,umbrellas,binoculars.Dizzy also provides a welcome pack which includes: wine,beer,bread,bacon,eggs,tea,coffee,sugar,butter which is most welcome and a very thoughtful gesture. Tala is a lovely small,quiet village.Very close to the apartment there is a good supermarket which was very handy.Also a traditional restaurant which was nice and an Italian restaurant which we would highly recommend.If you walk up the steep hill you come to Tala Square where there are a handful of tavernas.We would recommend hiring a car. There is a reliable bus service but only every hour and forty minutes to the old town.If you are looking for a peaceful holiday in luxurious accommodation with exceptional personal service from the owner this is the perfect choice. Hi Guys. Thank you for your lovely positive review, which is very much appreciated. It is gratifying to know the effort I put into "Dizzy Heights" for my Guests is well received. It was such a pleasure to meet you & I hope to have the pleasure of welcoming you again in the future. With Sincere Regards, Dizzy. An outstanding property with beautiful panoramic views. You need to take nothing but clothes. A welcome pack is a God send....who wants to go shopping as soon as you arrive at your destination. Towels, toothbrushes, toothpaste, shower gel, shampoo,washing liquid, are all supplied and you can choose what you want in the food pack. A very comfortable property and the double terrace is a suntrap.Ideal for sunbathing or eating al fresco. The property is on a small complex which was very quiet at the time we stayed. The owners live on the complex and are at hand if needed and very helpful. We will definitely be returning. Hi Jakey. Thank you so much for your lovely review, which is greatly appreciated. I am delighted you loved "Dizzy Heights", the Complementary Arrival Pack, and all the little extras I provide for my Guests. My goal is to ensure that when my Guests arrive, their first meal and their first breakfast are catered for. No matter what time my Guests arrive, they do not have to go out shopping for basics. This enables my Guests to settle into the apartment stress free - to me, a perfect start to their holiday. It was such a pleasure to finally meet you both, and I really enjoyed all the correspondence we exchanged prior to your arrival. I would also like to thank you both immensely, and I use the word "immaculate" here, you guys were unbelievable. I very much look forward to welcoming you both again on your next visit. With Sincere Regards, Dizzy. Cyprus is the perfect holiday destination for everyone at every age, as it has absolutely everything; history & archaeology, wow scenery & incredible nature walks, wonderful beaches & water sports & the azure Mediterranean Sea, culture & handicrafts, vineyards & wineries, beautiful monasteries & ancient buildings, incredible flora & fauna, orange, lemon, olive & fig trees, picturesque Troodos ski resort ( skiing mid-Jan to mid-March) & wonderful Cypriot wine, our own award winning Keo beer, incredible cuisine & wonderful hospitality; & so much more. If you are planning your wedding in Cyprus & looking for the perfect Honeymoon Hideaway, then it is the place for you! Car hire is recommended. Paphos Airport is approx 20 mins away & Larnaca Airport is approx 145 mins. Car hire is available at both airports upon arrival, or you can pre-book via the internet & your car will be at the airport awaiting your arrival, which is the better option. In addition, airport taxis are available, & I can also arrange a private taxi pick-up upon arrival & departure via an excellent driver at a better rate. There is also an excellent bus service which covers the whole island. Tala village square is within walking distance; about 20 minutes & is a popular place both day & night with its Cypriot & British tavernas, restaurants & bars, & is the hub of the village. It is loved by locals, British residents & visitors & provides a perfect taste of Cyprus. The villages of Emba, Kissonerga, Chlorakas & Coral Bay are a few minutes drive, where you will find many amenities to suit all tastes, & all have excellent food outlets to suit everyone. Many places of interest are close by to explore & enjoy. After a perfect day - if you do not feel like catering, there is a variety of night life a short distance away. A 3 min walk to an excellent Cypriot restaurant providing a varied menu & it serves a superb Traditional British Sunday Lunch (pre-booking a must for Sundays). A 5 min walk takes you to an excellent & popular Italian restaurant. A 3 min drive or a 15 to 20 min walk to our quaint Tala Village Square, with a selection of Cypriot & British tavernas, restaurants, bistros & bars providing excellent cuisine & entertainment such as traditional Cypriot dancing & all are highly recommended. Should you want a more energetic evening, a 15 min drive will take you into Paphos & the abundant choice of night life from tavernas to restaurants to British pubs, to discos & everything in-between. Taxis can be arranged. A taxi rank is in the heart of the Paphos night life to return. A 2 min walk to our lovely supermarket catering for most things including English newspapers, and is also has the only underground Cava in Cyprus. There is also a chemist, hairdressers/beautician, & several other outlets near the supermarket; including a bank & an ATM machine. There are supermarkets, banks, restaurants, tavernas & local shops a 10 min drive & many more in Kato Paphos & Paphos, plus the prom, the Med, & a bubbly tourist area with everything else a 15 min drive. Tala is central for everything & everywhere, & Cyprus has something for everyone at every age no matter what your interest to make your holiday a memorable one. So much to see & do, or just relax, switch off & soak up the sun & Cyprus has plenty of that too & fine dining close by - perfect. Please Note: The apartment is for sale, with viewings from 31 March 2019 after my dear friends have had their last holiday in the apartment. If you are interested in the apartment please got to my personal website at www.dizzy-heights.com. Thank you.